I love comfort food! There is something so satisfying about eating a casserole or fried chicken on a Sunday afternoon. For a number of years when my husband and I first got married I stopped making any type of comfort food. I am lucky that my mother-in-law makes a delicious broccoli casserole and there seems to be a Cracker Barrel at every exit in this area. So whenever I got a craving for chicken and dumplings I could easily find them somewhere else other than my own kitchen. Slowly though I got tired of only having comfort food at restaurants and other people's houses and started making my own recipes at home. I fell in love with chicken pot pie made from scratch and started making it at least once a month. Even though I have a number of pot pie recipes that I love I was interested when Woman's Day magazine had a recipe for Chicken Pot Pie using the slow-cooker and a puff pastry topping. This recipe has 12 ingredients. It takes 7 hours and 15 minutes, 15 minutes of which is active and makes 4 servings. All the ingredients were easy to find at my local grocery store and I made no ingredient modifications. The only changes I made to the recipe was in regards to the puff pastry. My puff pastry took less than the 20-25 minutes suggested. I would say that my puff pastry was full browned at approximately 15 minutes. Additionally, I made my chicken pieces smaller than 2-inches, probably closer to an inch. I felt the smaller pieces were better for my two kids. I followed the remainder of the recipe as written. With the leftover puff pastry I made dessert puffs with nuts and honey for my two boys. They were very popular with my two boys and made a great sweet ending to the meal. The chicken pot pie turned out delicious. I love that it uses the slow-cooker and that the puff pastry is added at the plate. The puff pastry makes a great flaky topping and the flavor from the dill was great. I would suggest cutting down on the amount of dill if you aren't a big fan of the taste of fresh dill. The dill definitely has a definitive flavor, so if dill isn't one of your favorite herbs I would suggest cutting the total amount in half. Overall, another great slow-cooker recipe that has all the flavor of a traditional chicken pot pie recipe with very little effort. 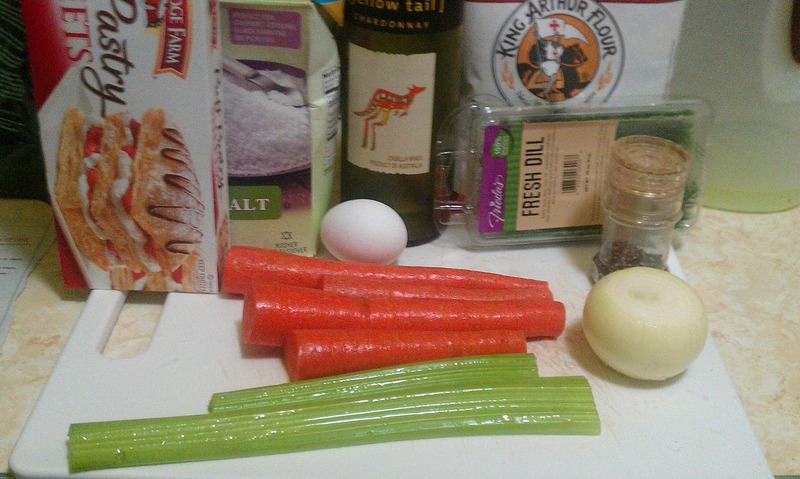 For the recipe go to Chicken Pot Pie. Thanks :) It was very popular in my house and easy since almost everything is done in the crockpot! love this recipe. thank you. definite comfort food! It definitely is comfort food, which I love! Thanks :) The use of the puff pastry on top was delicious and very kid friendly! This is right up my alley! Thanks for stopping by my blog too. I'm gonna love stalking yours! Thanks :) It really is an easy recipe! Yum. Yum. Yum. LOVE comfort food. Is there any other kind?? Chicken pot pie is great. Can't wait to try out this recipe! I also love that you used the left over puff pastry to make dessert. Thanks, Frugal! The puff pastry desserts were pretty yummy and only lasted around ten minutes after I made them :) I agree that chicken pot pie is great, yum!